I cut the bag out in red and cut along the score lines for the back panel. I used the smaller die that comes in the set for the white panel. I added some Washi along the bottom. I stamped the sentiment from the Seasonal Sentiments set. 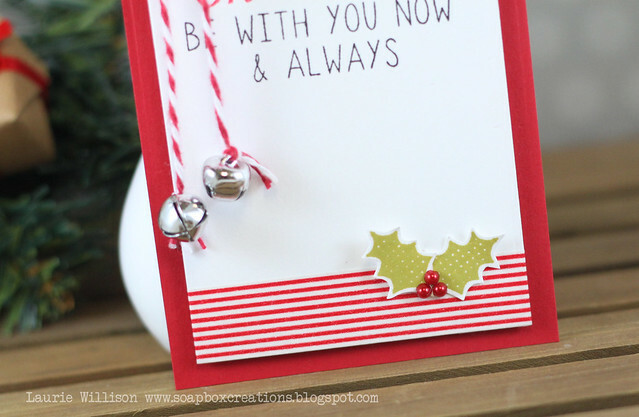 I masked off the top and bottom sections, so I could stamp the "Christmas" in red ink. 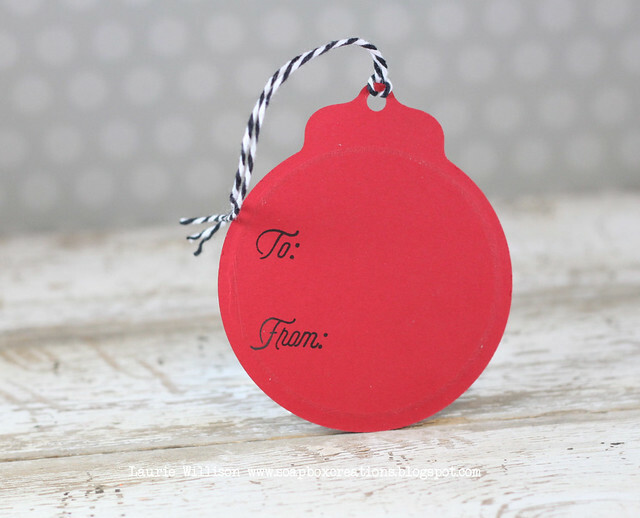 I also stamped the holly from North Pole Wishes and attached them to the bottom of the tag. I added in some red pearls for the berries. To finish it off, I added a white clothespin and some twine with little bells on the end. That's it for me today. Are you all ready for Christmas? My house has been decorated for over a week now. I am so happy! I love this season! Shopping? I have tons told do! I must get busy! Happy Thanksgiving! This post is a little more Christmas than Thanksgiving....but I am ready for Christmas! I have something so fun to share today. 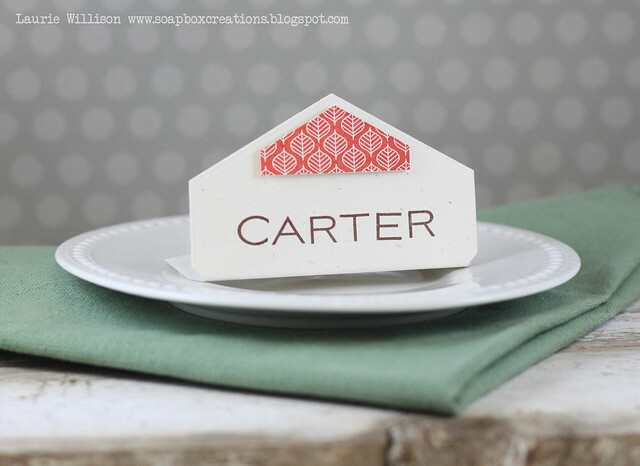 I recently posted a picture of some crafty projects I made recently at a class I held here at my house. 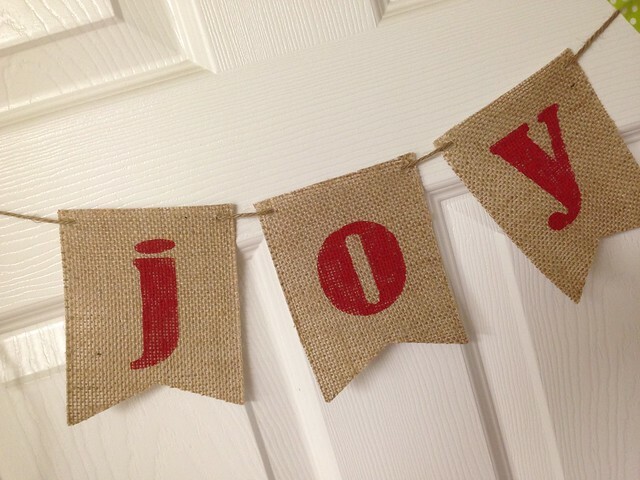 One of the projects was a "be merry" burlap banner and I had several emails asking questions, so I thought I would share how I made it! 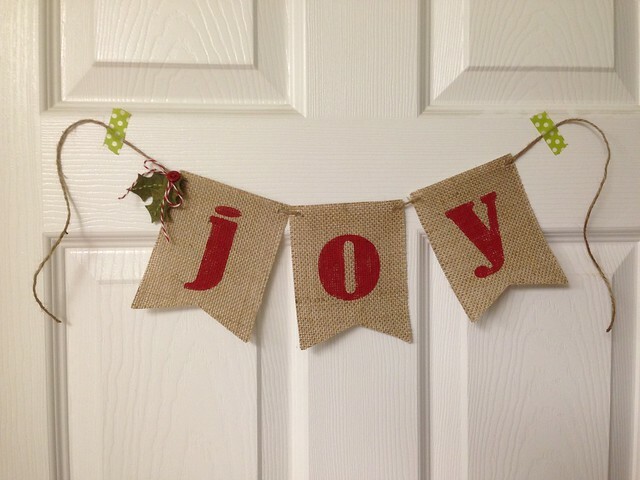 When I first organized the class, I found a ton of pictures of burlap banners all over Pinterest. 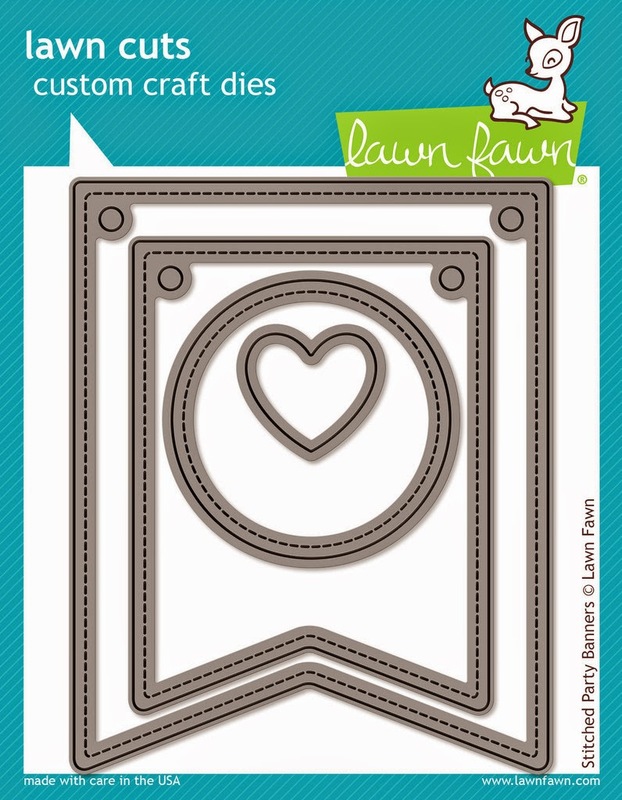 I instantly thought of these fabulous Lawn Fawn Stitched Party Dies and how cute they would be in burlap! So I cut out several banners using the LF banner die and got to work. Over the time it took to make all the banners for my craft class, I realized that the burlap banner was pretty delicate and needed some reinforcement. I always use interacting when I cut fabric with dies, so I figured I could use the same with burlap. 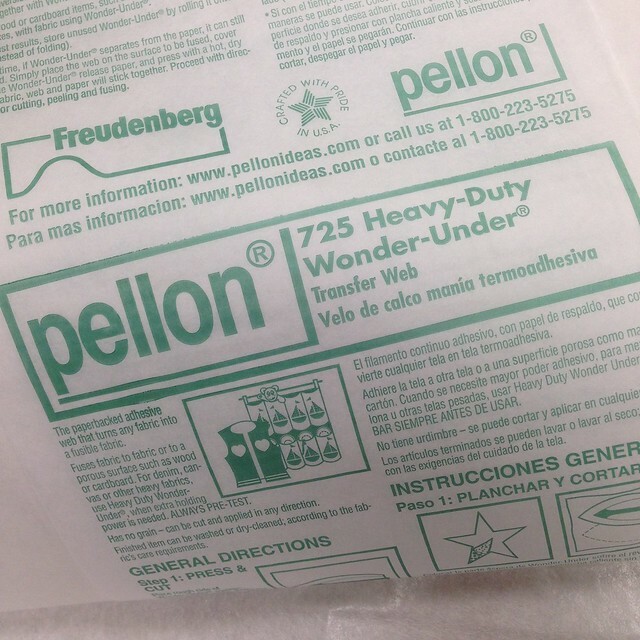 I found the "Wonder Under" in a heavy duty strength at Hobby Lobby and figured it would work great! Here is the how-to video! Thanks for coming by today! I hope you enjoyed my video! Have a great day! 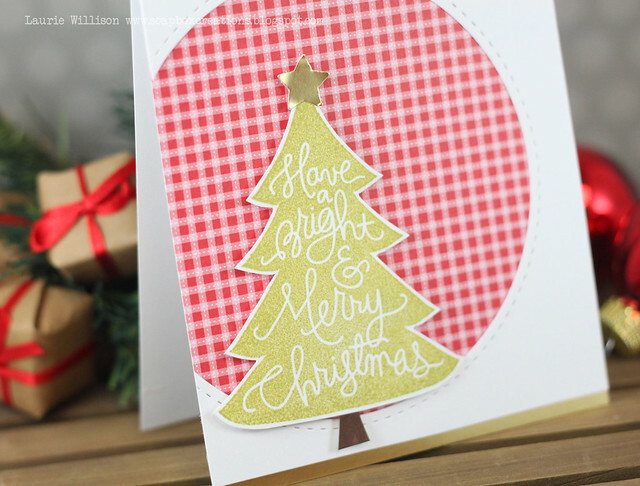 I used the dies from Papertrey Ink's Tinsel and Tags kit. I layered them onto the bottom of the Basic Bookmark 1 die an the cut of the bottom to match the rounded edge of the other white die cuts. 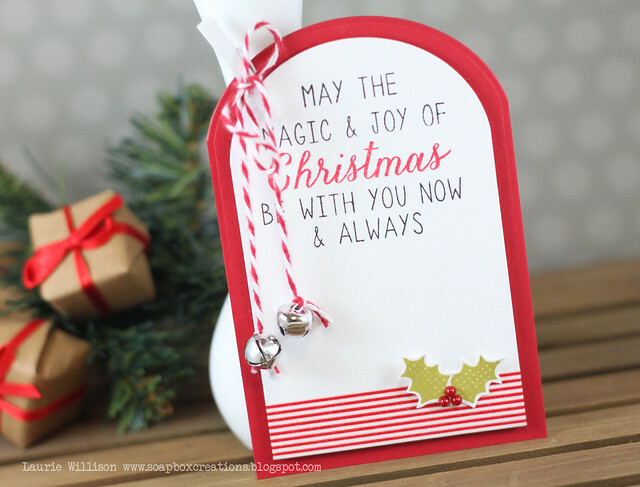 I stamped Merry Christmas in Pure Poppy on the little snow hill and then added in some white gel pen dots in the background. I finished it off with some stickles and some Pure Poppy ribbon. 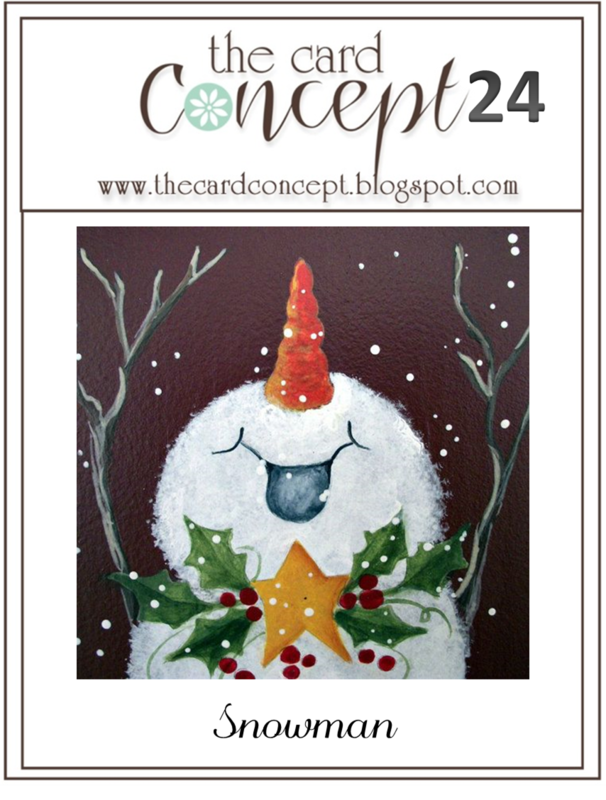 Stop over the Card Concept blog to see what the rest of the team has for today. Thanks so much for stopping in! I used the Dual Stitched circles from Lil Inker on the base of my card. I added in some Pure Poppy patterned paper underneath. 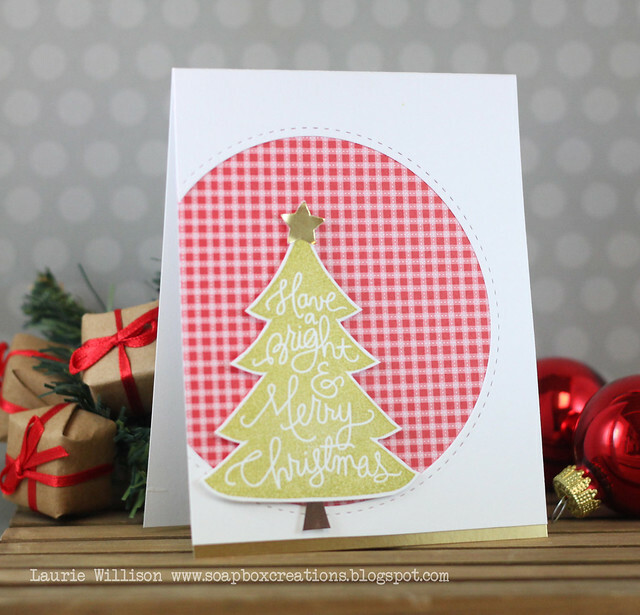 I stamped this adorable Christmas Tree from SSS and added in a scrap of card stock that I colored with a brown Copic. I popped the tree up on foam tape and layered it on the front. Next, I used a little star die and some gold card stock to decorate the top of the tree and a little strip along the bottom. So that is it for today! So happy to be inspired this morning. I am looking daily for the lost mojo and this makes me happy. I am however having TONS of fun with some DIY crafting. I recently hosted a Christmas craft day at my house and we made several things. Here is picture of everything grouped together. We made the burlap banner on the wall. I used the most amazing Lawn Fawn banner dies for that and then we painted the letters on with stencils I made using my cameo. 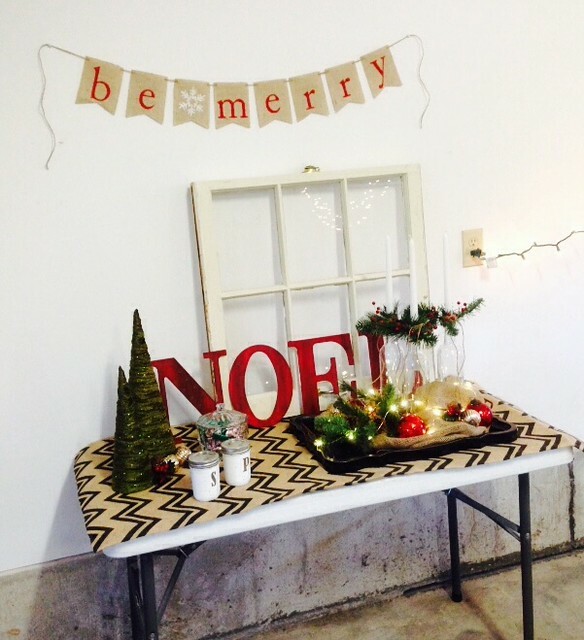 We painted the NOEL letters with a gorgeous red and brown wash. We painted and distressed the mason jar salt and pepper shakers and then we decorated the wine bottle/candle holders on the tray. The tray is all decorated up and currently sitting on my table. I love it! I have 2 big distressed signs in the works, so I will have to come back and share soon! Hope you are all doing well! Thanks for coming by today! Hey there! Another long time no see. It's been crazy around here with zero crafting, sick kiddos and lots of the usual fun busyness. I am SO excited that Christmas is in the air. The tree is going up and the decorations are coming out and I know. It's early. But I don't care. I love Christmas and I need it to last for awhile so I'm starting now! 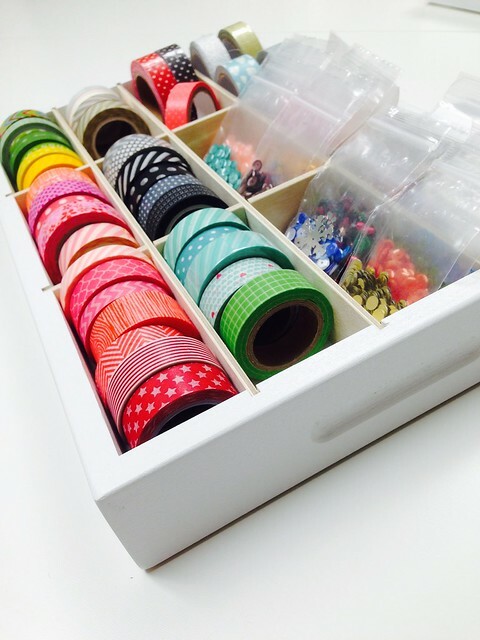 This Washi Tape and More Caddy is the perfect way to keep your washi tape organized and ready to use. 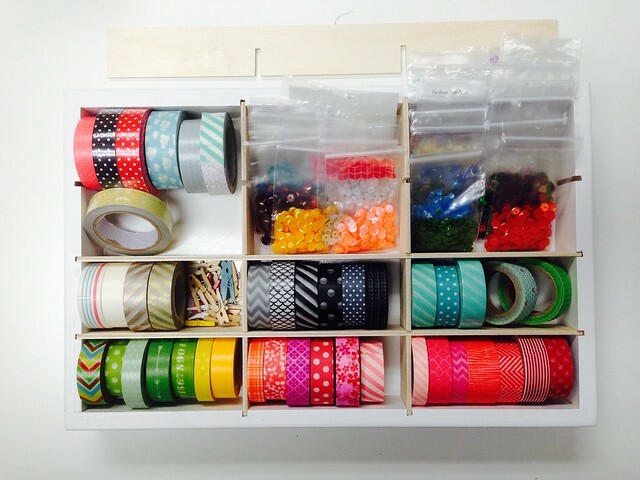 The 12 cubbies each neatly holds groups of tape So, you can arrange them with like colors. With the premium grade wood inserts, the cabinet grade birch casing, and markerboard bottom, this unit is extremely durable. The casing is painted white for a nice, finished look and feel. 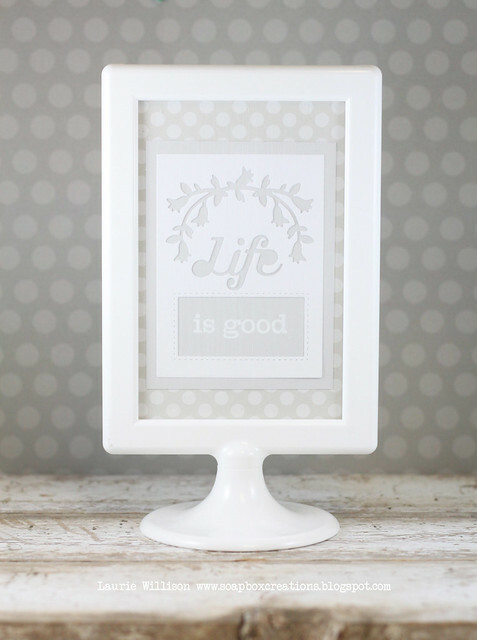 It fits right on your desktop or shelf and can easily be carried from place to place. Part of our new Desktop collection of organizers. 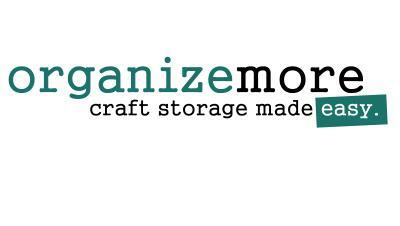 Only from OrganizeMore! 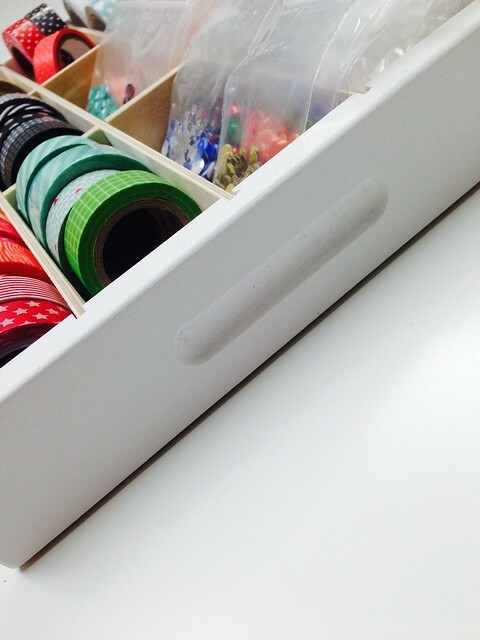 This is the same bright white paint used on the ink organizers I have reviewed (and use and LOVE) in the past. 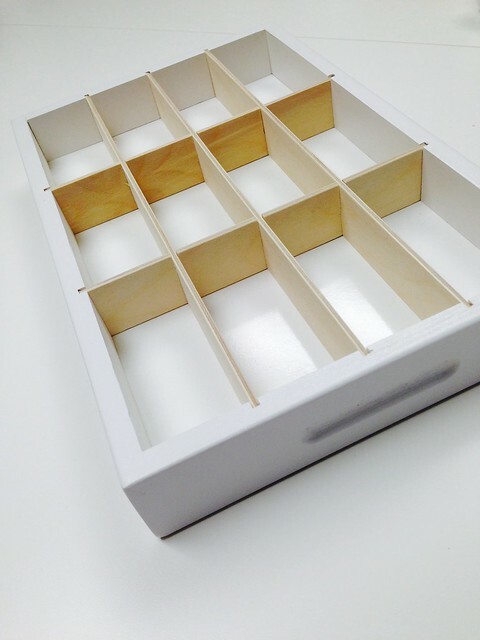 The build is very sturdy but still light enough to move around your workspace or in a drawer. 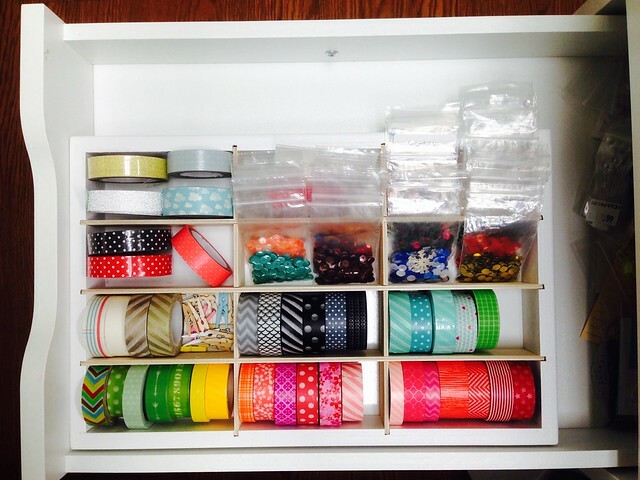 I use mine for both my washi and sequins. You can see the corners are well put together, sanded nicely and just a great quality product. The frame is made with pine and the inside dividers are a lighter wood. There is a nice handle that I think makes this looks so finished. Here is another shot showing all the compartments. You can see the larger rolls of fabric tape fit just find but at another angle. 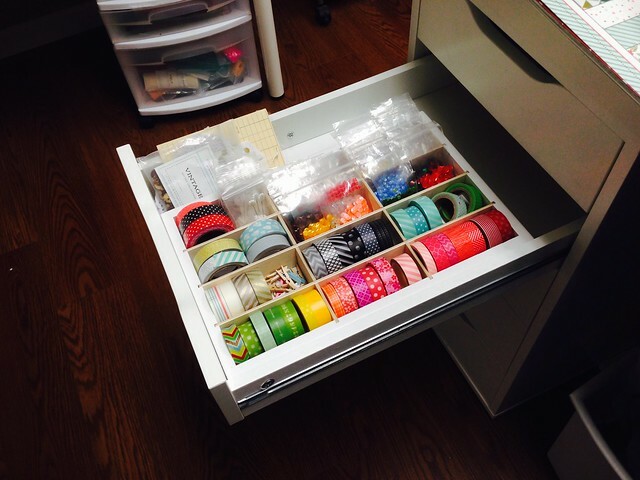 I have the little bad of washi lined up, too. The long dividers do slide out if you want to make the compartments bigger. There is room to spare, so I can fit larger embellishments or tools on the side, too! Do you want one of your own? I know you do! Keep reading! 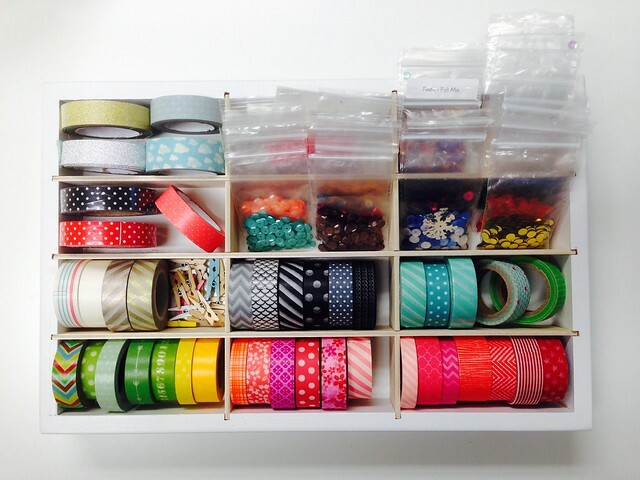 Organize More is going to give one caddy (washi not included) to a lucky commenter here on this post. 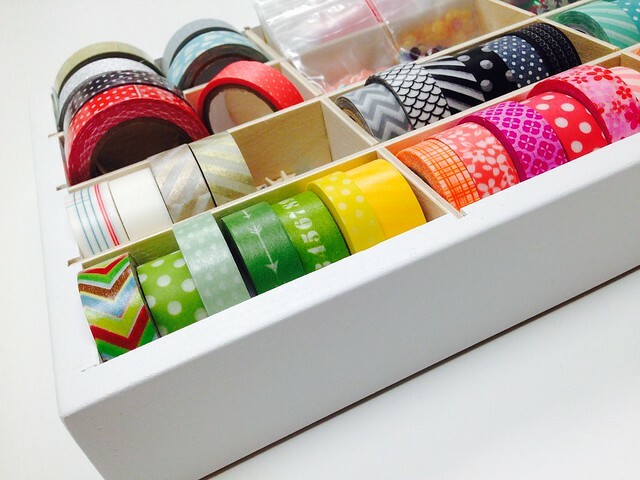 Leave a comment with your favorite use for Washi. I will close the comments on Wednesday, November 26th at midnight CST. They have also been generous enough to give out a 10% code for your purchases. Just use "SOAPBOXNOV14" for 10% off before shipping. 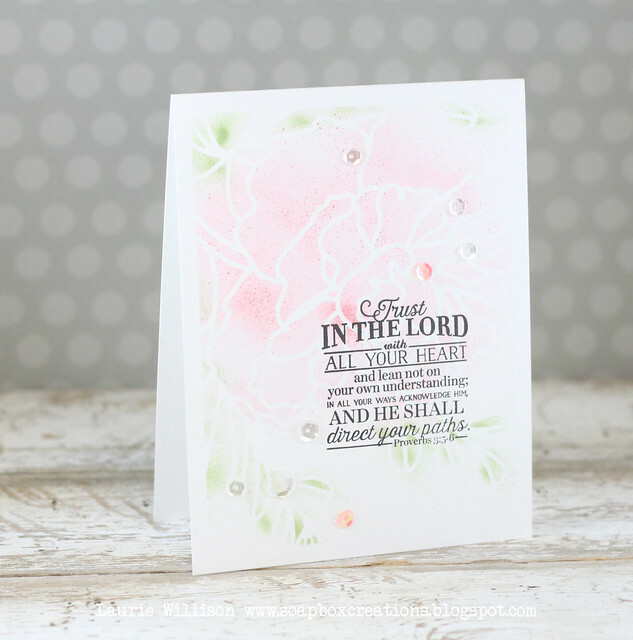 First let me show you how I used the Mat Stack 7 Basics stamp set and die. 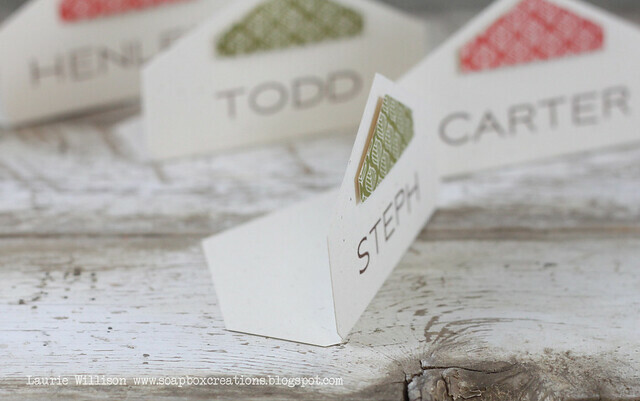 I made a set of place cards for Thanksgiving! I took the largest Mat Stack 7 die and scored it right down the middle. I added in a little image from the stamp set, popped up on foam tape, then I stamped out the names using the Fresh Alphabet...best alphabet ever!! 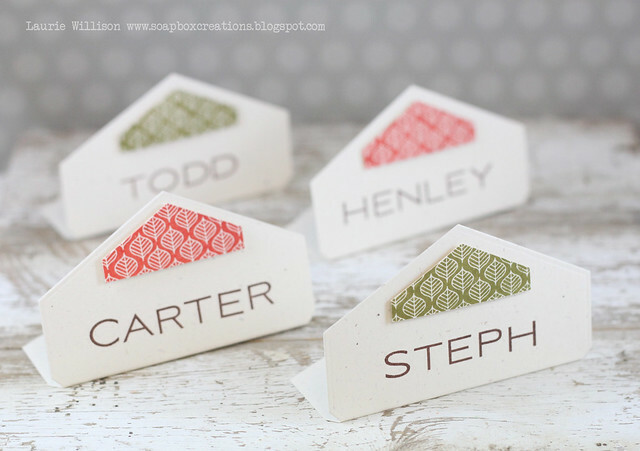 These dies work AMAZING for place cards and have that great finished look. AND they are SUPER easy! When I saw the newest Monthly Moments die, I saw a tag. I ran it through again with gold card stock so I could have some gold triangles. 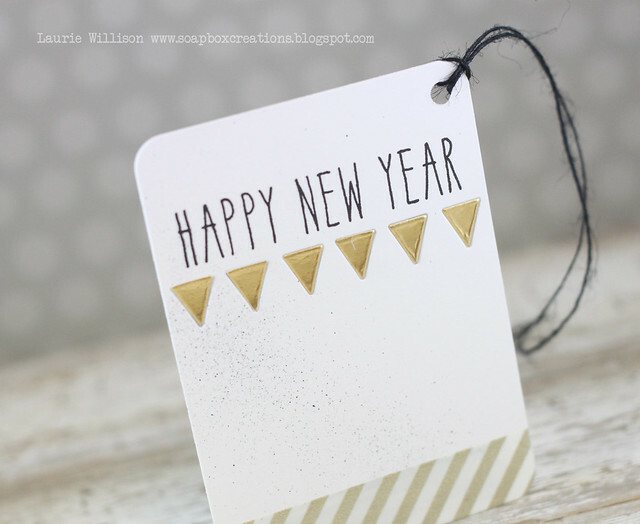 I put a piece of washi behind the die and added in the gold triangles in place. 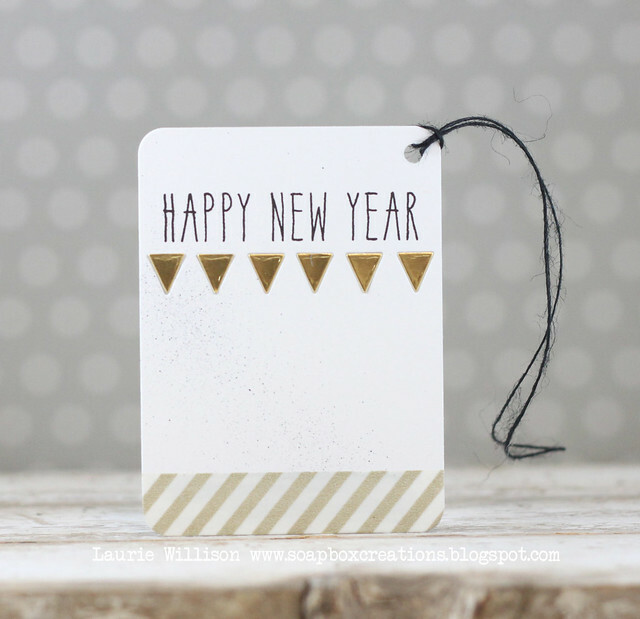 I misted the front of the tag with black Copic and then added in a strip of Gold Striped Washi. I punched a hole in the top corner and used some black twine for the tag. I think this will look adorable on a bottle of wine. 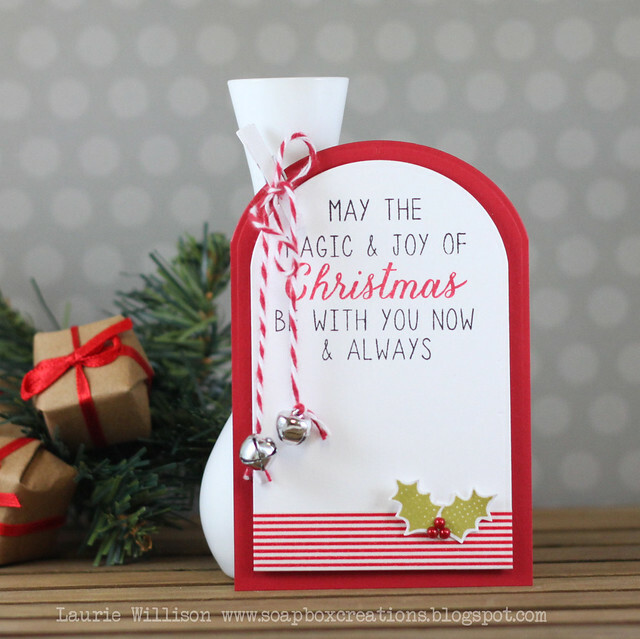 For this next card, I cut out the Journal Card 6 and stamped an image from Fair Isle Motifs until I had the tag covered except for just a small section of the bottom. 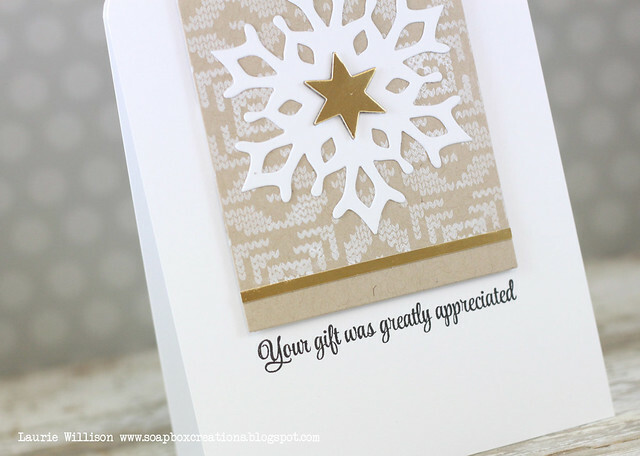 I added in a strip of gold yardstick at the bottom and then a snowflake from Fancy Flakes on top. The little gold star I added in with foam tape. 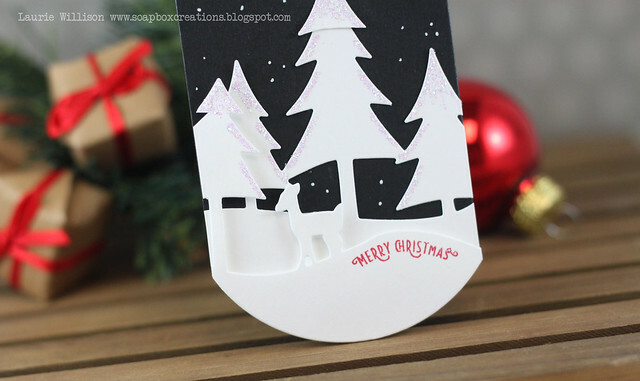 I popped up the whole tag on the card base and then cut the top off of the tag. Last, I stamped the sentiment in black under the tag. 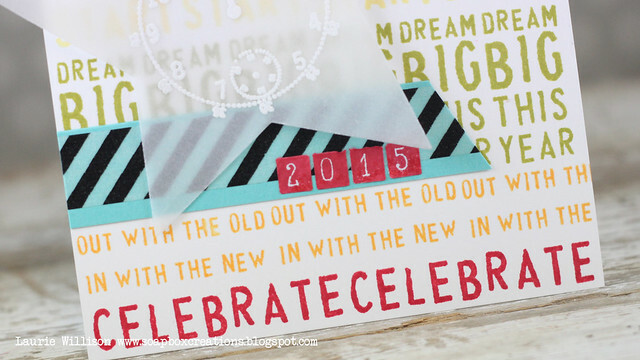 I used several sentiments in the Happy New Year set and stamped out a colorful background. I layered a pice of Hawaiian Shore cardstock and black washi. 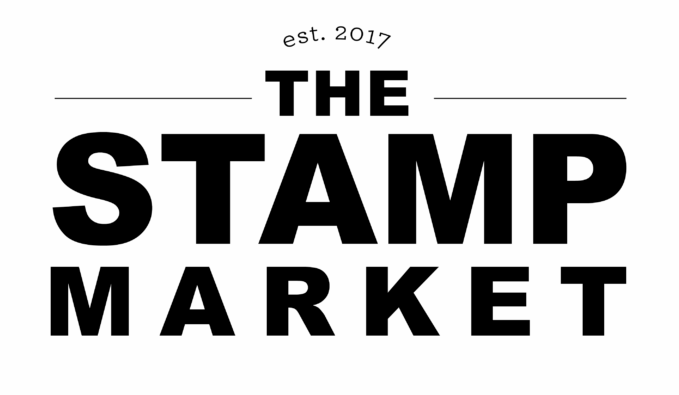 The cutest most fun little number stamps are available this month and I love this so much! 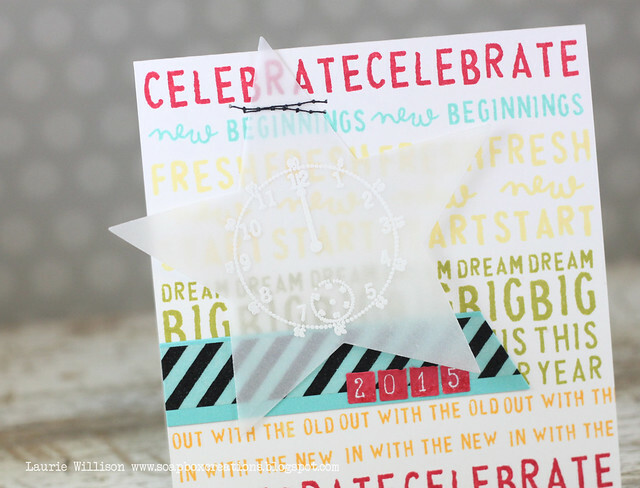 I stamped and die cut 2015 on a sheet of labels and added them in. Last, I heat embossed the clock image on the star die (from the Star Shaker dies) and sewed a few stitches on top to hold it in place. 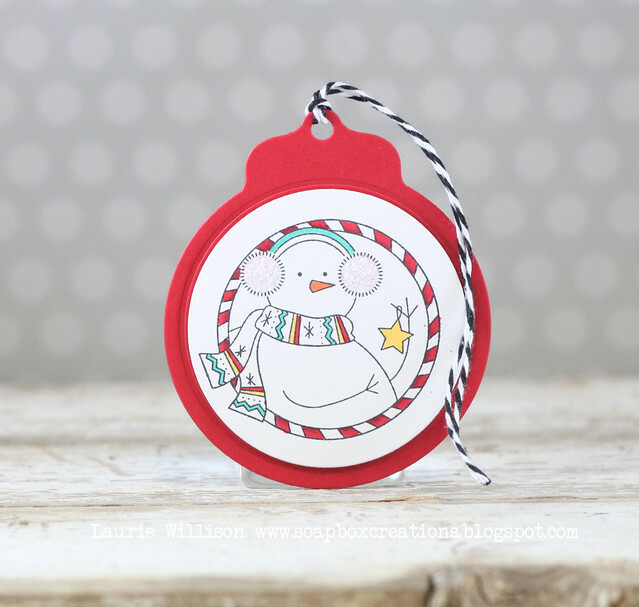 I made a tag with Pom Pom Pals. I stamped the image and colored it in and then added it onto the Tag Sale #4 die. 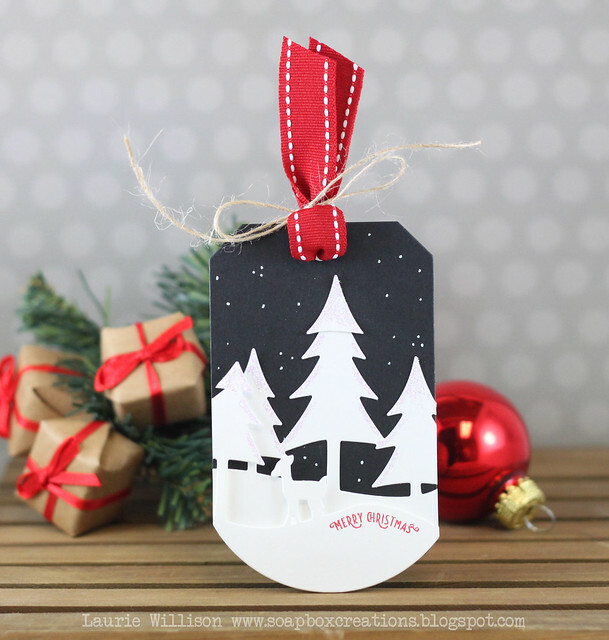 I stamped the To: and From: on the back, after adding in some black and white twine. 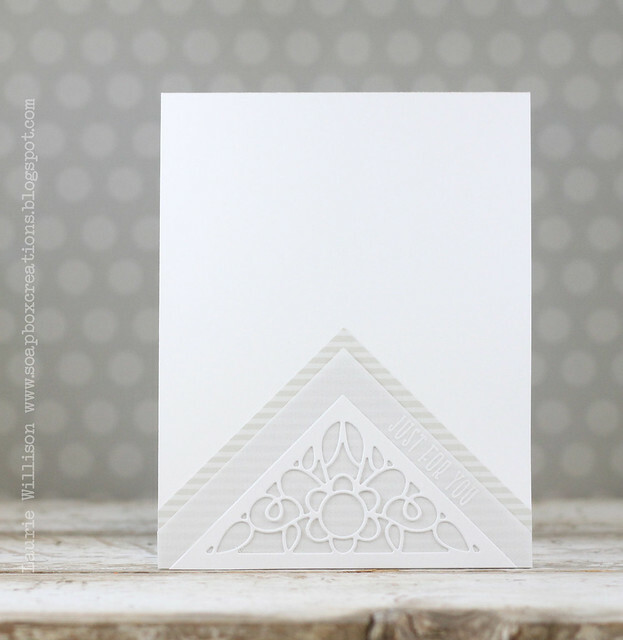 I used the new Cover Plate: Peony for this card. 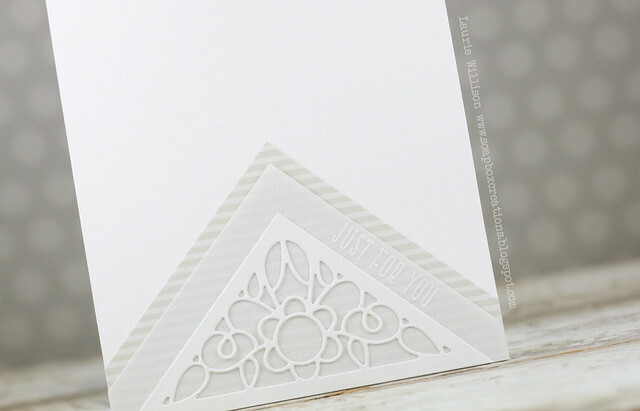 I cut out the plate onto a white adhesive sheet and the attached the cut out to the card base. It made a great mask. Then I used a Copic Airbrush to lightly mist over the mast. 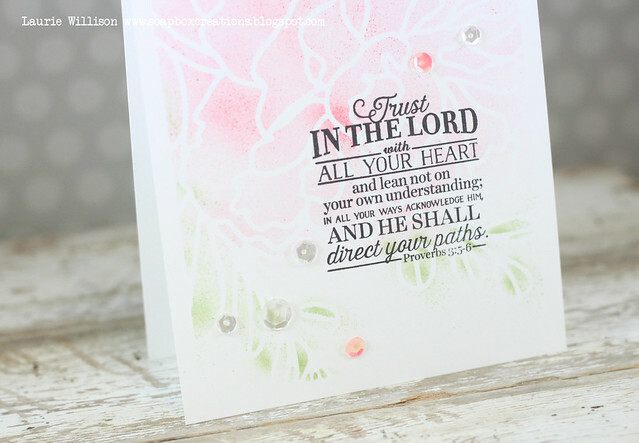 I stamped the verse from A Cheerful Heart and then added in a few sequin. 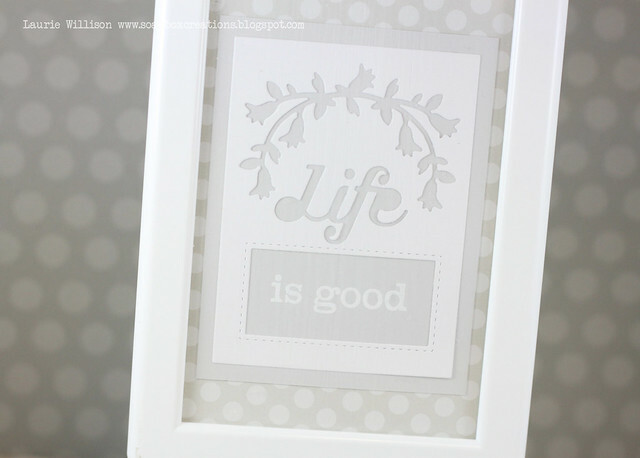 Have you seen these picture frames from Ikea? 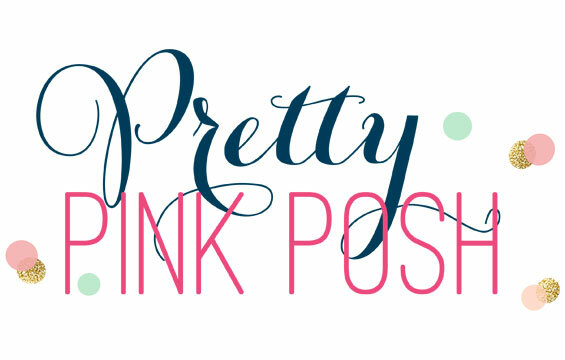 They are just so fun because you can slide a picture in or even a handmade creation. I use the newest Phrase Play #10 to make this little framed piece. You may have already seen this card HERE, but wanted to share it again. I love the Floral Flaps die. It has so many possibilities!